From her writings, we know that Julian was most likely born in 1342. She lived in Norwich or nearby and may have been from a privileged family. Her real name is not given in her texts. She may have taken her name from the parish church of St. Julian at Conisford in Norwich where she had a cell and lived as an anchoress or perhaps her real name was Julian or Juliana which was a common name at the time. We don’t know if she married or if she had children or even if she was a nun. We don’t know how she got the education that allowed her to write her books. Julian may have learned reading and writing from her mother or from the priests in her parish. Throughout her writing it is evident she sought teachings and preaching from her local priests. Everyday medieval life was inextricably linked to the church. Norwich at the time of Julian’s life was a vibrant town whose wealth came from sheep breeding and wool production. There was trade with the Low Countries, Zeeland and France. At the time of Julian’s birth, Norwich had a population of about ten thousand and it was the second largest city in England. She and her family would have spoken English. Latin was spoken in the churches and the merchants and upper classes spoke French. A decade after her birth, the King made English the official language of his court. When Julian was six years old, Norwich was visited by the pestilence known as the Black Death for the first time. Julian herself survived but within a year, three quarters of the population of the city was dead. It persisted for three years. The city itself came to a standstill. There were no workers to repair roads or shepherd the sheep. The wool trade ceased. Slowly, slowly life came back to the city. When Julian was nineteen, the steeple of Norwich Cathedral fell to the ground in the storm. It seemed to be an omen. A few months later the Black Death returned and this time it targeted infants and small children. Medieval people believed the plague was sent by God as punishment for man’s sins. But everyone from all walks of life and all classes died from the plague. It was a confusing and perplexing time. The plague returned once again in 1368 along with a cattle plague and a bad harvest the next year. In 1372, Julian states she was thirty when she succumbed to a fatal type of illness. She was confined to her bed in her mother’s home, surrounded by those who were nursing her. She came close to death several times. At one point the family called the local curate to perform the last rites. While he was performing the ritual he held up a cross for her to contemplate upon. At that moment, she began to have visions. She saw Christ on the cross and the blood, lots of blood. Her health began to improve after this visualization. She would have a total of sixteen visions during her slow recovery from illness. As she regained her strength, she began to wonder what the visions meant and why they were shown to her. When she was healthy again, she possibly worked with a friar on discussing and learning about the visions and their significance. She wrote down a short version of her visions that may have taken many years to write. This became known as the Revelations of Divine Love: Short Text. The book consists of twenty five chapters and has about eleven thousand words. It is believed to be the earliest surviving book written in the English language by a woman. After many years of studying and meditation, she may have decided she couldn’t keep what she had learned to herself. She thought about writing down her visions and their meaning in more detail. This would be an enormous undertaking for anyone, let alone a woman. To write her book she would have needed to withdraw from the everyday cares of life, to a place of peace and quiet so she could concentrate on her work. She would have to become a nun or an anchoress. Living as an anchoress was a form of consecrated life that didn’t require the vows of becoming a nun. An anchoress was the female equivalent of an anchorite. The woman would withdraw from secular life for religious purposes, in effect becoming a hermit or recluse. Anchoresses lived in seclusion, sometimes in a remote location or in a walled room with only a shuttered window through which food was passed. This room would often be connected to a church. Sometime before 1394, Julian made her final decision retreat into isolation. She could devote her life to praying, writing and giving counsel to her fellow Christians. Her friends worked with the church of St. Julian’s near Conisford Street in Norwich. Julian got the blessing of the local bishop for her plan and the money needed to build her cell was raised. The construction went quickly and soon everything was in place for Julian to start her new life. She appears to have had a servant woman who was enclosed with her named Alice. While she is enclosed it is most likely she began working on the Revelations of Divine Love: Long Text. This book has eighty-six chapters and approximately sixty-three thousand words and may have gone through many revisions. Julian received several bequests funding her life in the enclosure over the years. She also had another servant named Sarah. Her reputation as a counselor, holy woman and mystic spread far and wide. 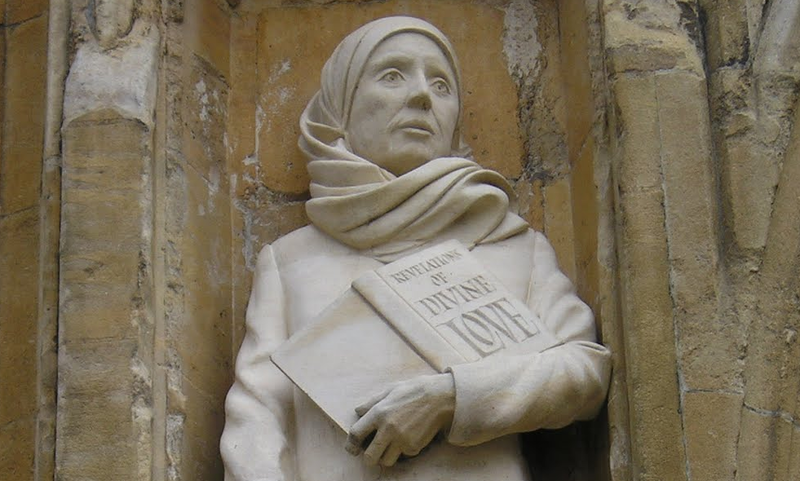 Margery Kempe, another woman who had mystical visions mentions in her biography that she visited Dame Julian at her enclosure during one of her pilgrimages across England. We know Julian was still alive in 1416 when she received a gift from a patron and she would have been seventy-four. After that she disappears from the record. When she finished her manuscript, it’s believed she passed it to a young nun from nearby Carrow Abbey who had come to visit Julian often. The nun copied it and sent it to the nuns at Syon Abbey near London. From here, it made its way to several libraries. During the Dissolution of the Monasteries under King Henry VIII in the sixteenth century, copies of her book may have left England and gone to the continent along with some of the displaced monks and nuns. Julian’s book had not been mentioned until a copy of the “Long Text” surfaced in the mid 1600’s in France. An English Benedictine monk named Serenus de Crecy found Julian’s book in the Bibliothèque Nationale in Paris. In 1670, with the permission of his abbot, he had the book printed. But it wasn’t a success. Two hundred years later, a copy of the book surfaced in the legacy of Sir Hans Sloane which was the beginning of the British Museum in 1753. Sloane was an avid collector of many things including manuscripts. Within his collection were two copies of Julian’s book. In 1853, Serenus de Crecy’s book was reprinted and in 1877, Reverend Henry Collins printed one of the Sloane manuscripts. Again the book wasn’t successful but we do know Florence Nightingale took a copy of Julian’s book with her on her nursing expedition during the Crimean War. In 1901, a woman named Grace Warrick brought a book to Methuen for possible publication. All we know about Grace is she was forty-six years old and from Edinburgh. She had taken Julian’s book and translated the fourteenth century English into modern English, annotated and footnoted it and made cross-references. Methuen probably had no idea they had a best-seller but the book was reprinted over and over for the next seventy years. Julian’s book was now brought into the twentieth century. Even more astonishing was what happened eight years after Warrick’s first printed edition of the “Long Text”. Lord Amherst’s library was dispersed through a sale and among his books was a collection of medieval manuscripts bound into one volume. It included Julian’s first draft of her book (“Short Text”) written soon after her visions in May of 1373. In 1988, a lecture was given in Norwich by Sister Benedicta Ward, a historian and an enclosed nun. In this lecture, Sister Ward put forth a case saying because Julian’s books disappeared, she most likely was not affiliated with any abbey or convent and therefore not a nun. She was surrounded by her mother and family when she was ill, not sisters. Her family sent for the curate which indicates a household or parish priest. Sister Ward also believed that due to the traditions and way of life at the time, women married at fourteen or fifteen years old, especially during times of crisis such as the Black Death. Ward argues that Julian was probably married and had children and her children may have died during the plague. Most likely she was a widow too which allowed her the freedom to withdraw from everyday life into her enclosure. Whatever the truth is about Julian, she certainly lived an astonishing life, surviving plague, a potentially fatal illness, mystical visions and a solitary life. Her legacy lives on in her extraordinary texts which came to light after being hidden for hundreds of years.